Theories regarding the peopling of North America have developed in the past several centuries. 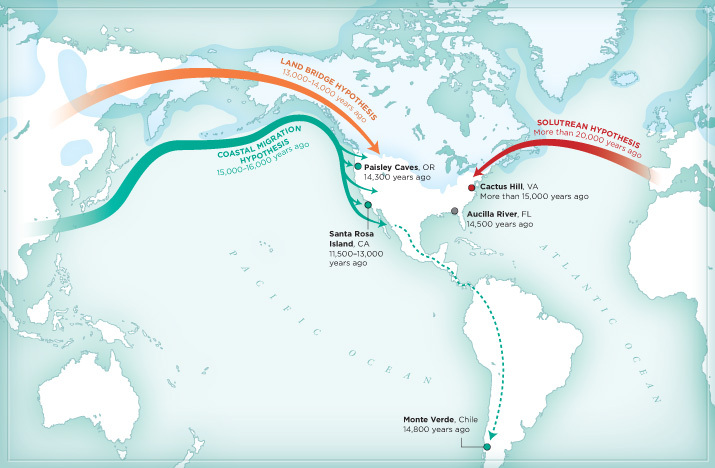 In the recent decade, there have been further developments in how people migrated to North America or at least appeared here and archaeologists have been highly invested in the technology of the times: DNA interpretation, new radiocarbon dating of old sites, and new evidence from Last Glacial Maximum, LGM. It is a highly active, dynamic and controversial time to research how people arrived in North America, or did they. To further complicate the distance between modern science and Native stories, the science discoveries have been moving rapidly and in several directions without conclusion. Does this mean one should dismiss science interpretations for myths or to at least find a sensitive and meaningful personal use for the creation myths and the overall meaning embodied in them? A cursory look at the present dominant theories regarding human migration to North America is presented here. One could search all over the Internet for other sources and relative reading regarding these theories. Sources have been provided here and a summary of each ongoing theory along with its current interpretation. By understanding these theories and then read suggested Native creation myths one may build a deeper appreciation for Native understanding of their land, which goes back thousands of years. First Americans, David Meltzer, Ph.D, Southern Methodist University, provides a short and clear approach to the theories presented. Tthis article may not stay up for a long time. New World Settlers Took 20,000 Year Pit-Stop, Ker Than for National Geographic News, 2008, outlines that there were separate stages of migration-settlement, a popular trend in the theories. Beringia Land Bridge. Animated gif of its progress from 21,000 BC to modern times. Coastal Route Theory short and clear article complete with maps of the proposed theories and brief piece about Kennewick Man. The Kelp Highway Hypothesis: Marine Ecology, the Coastal Migration Theory and the Peopling of the Americas The link goes to the abstract which provides a substantial amount of information to start further research or at least develop an understanding of the theory that humans were subsisting on plant life and not megafauna. When did Humans come to America? Bradley, Bruce and Dennis Stanford 2004 The North Atlantic ice-edge corridor: a possible Palaeolithic route to the New World. World Archaeology 36(4):459-478. Bradley, Bruce and Dennis Stanford 2006 The Solutrean-Clovis connection: reply to Straus, Meltzer and Goebel. World Archaeology 38(4):704-714. "Most analyses of contemporary and ancient human DNA suggest that America’s first immigrants came from Asia. They traveled over a land bridge or along the coast. An alternative theory is that members of Europe’s Solutrean culture voyaged to the East Coast. (5W Infographics)"
The source is meant to help students make educated decisions about the material presented and provide an opportunity for critical analysis regarding primary sources of this kind and their value in historical research. When compared to the scientific research of the present time, Gookin's comments will bring an interesting challenge to conventional thinking. 1. The Daniel Gookin 1674 primary source recounts his description of Native Americans and their alleged origins in the 17th century. The copy provided was printed in 1970 almost three hundred years later and certain footnotes were added to provide clarity for the reader. The document does not hold up in the 21st century paradigm for how mankind populated North America. Students often need to make general distinctions about sources that are credible and relevant against those that are considered obsolete. This exercise provides the experience to critically analyze several documents. What are the glaring discrepencies in the Gookin document about human origins in North America? In section 2 Gookin makes reference to Native Americans as one of the Lost Tribes of Israel. Research thebeginning of the Lost Tribes of Israel theory, when and where did this theory originate and how does this theory hold up to current coastal migration theories? Final section 7 Gookin writes that the Natives are Adam's posterity. How do you respond to Gookin's overt extension of pity for a group of people that he has not completely understood? Is he condescending or just plain ignorant? Is Gookin a product of his own times? Why can one not project their own standards and perceptions from the 21st century upon a writer of a document from the 17th century? 2. Three coastal migration theories have been presented. They all seem to overlap and have levels of confusion embedded in them yet they all rely on hard artifacts such as arrowheads, bones, remains of structures, etc. Summarize each theory in its own 250 word summary. Which of the theories do you think will no longer survive based on current research and evidence and outline the basic weaknesses in each theory and basic strengths? 1.. Hunter, Kathleen A., Mary Pat. Knowlton, and Patrick J. Smith. The Native Americans of Connecticut: Holding on and Moving Forward. [Hartford, Conn.]: Department, 2000. 2. Gookin, Daniel. Historical Collections of the Indians in New England. Boston: Towtaid, 1970. Print. This site was created by Diana T. Mackiewicz at the NEH Summer Institute "Native Americans of New England: A Historical Overview," administered by the Five Colleges, Inc. and held at the University of Massachusetts at Amherst, MA, Summer 2013. Last updated August, 2013.